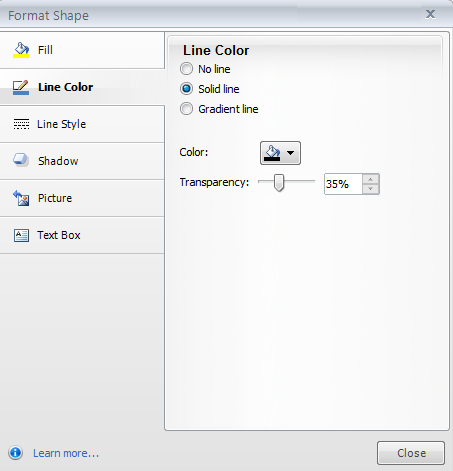 This tutorial covers the Line Color options on the Format Shape or Format Picture window. Here’s an overview of the other formatting options you can select on that window. This removes the line from the object. Or, use Storyline's color picker to choose a custom color from any thing viewable on your screen. To do that, click the eyedropper button in the lower-right of the window, hover over any area of your screen, and click to choose a color. 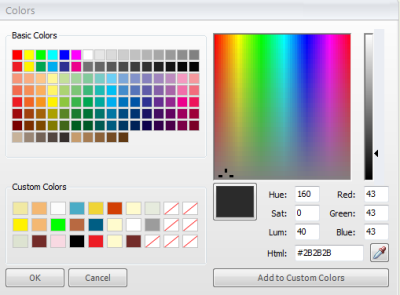 If the color you’ve chosen is something you want to save for easy selection later, click Add to Custom Colors. The color will get added to the bank of Custom Colors in the lower-left area of the window. Click OK on the Custom Colors window once you've chosen a color. Click Close on the Line Color window to apply the color to your object’s outline. This applies a gradient, which is a series of colors that blend into one another across the line. Direction: If you chose anything but Path for the gradient type, you can use the Direction field to choose from one of the preset directions. 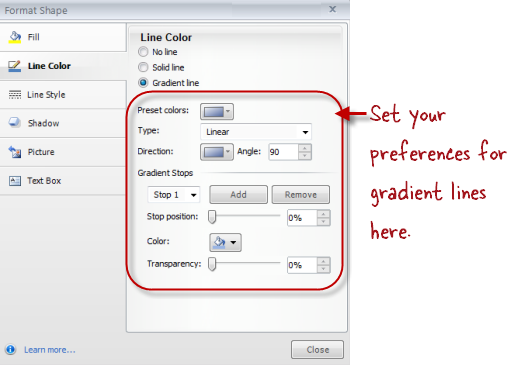 Angle: If you chose Linear for the gradient type, this selector allows you to customize the angle of the gradient. Stop Position: Drag the slider or enter a percentage to indicate where you want the new color to start. 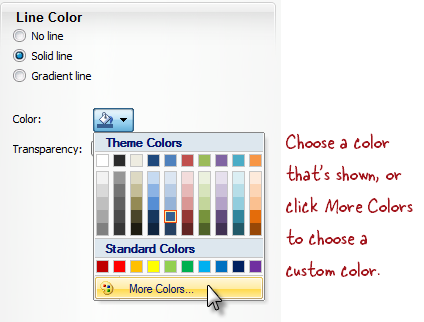 Color: Choose from the colors shown, or select More Colors to choose a custom color. Transparency: Drag the slider or enter a percentage. Click Close to apply your gradient to the outline of the object you chose.